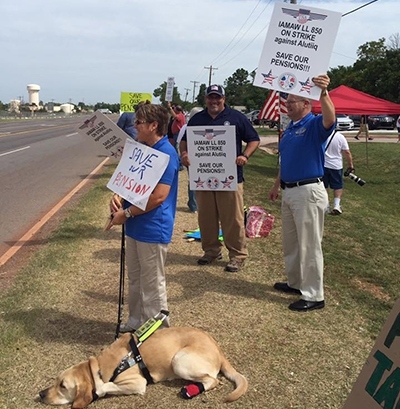 IAM Local 850 members, family and community supporters entered the second week of a strike against Alutiiq Commercial Enterprises at Tinker AFB in Oklahoma City to save their pensions. Now into the second week of a strike at Tinker Air Force Base, IAM Local 850 civil engineering workers are standing strong in their fight to maintain the pension that’s been in their contract for the past 16 years. More than 240 members are walking the picket line against Alutiiq Commercial Enterprises, a new contractor at the Oklahoma City base. Alutiiq, based in Anchorage, AK, took over the service contract from the base’s previous contractor on August 1, but has failed to implement the pension contributions negotiated in the existing collective bargaining agreement with the IAM. Local 850 civil engineering workers are responsible for maintaining the base’s electrical, plumbing, wastewater treatment and carpentry operations. Keep up to date at Local 850’s Facebook page .